(Heather Herrington 2014) 8 x 28 Em Re Ev UNUSUAL FORM CASCADE Lavender rose pink with darker mauve rose eye, very large green throat, and lighter midribs on petals 5 way branching and 25 buds ADVENTURES IN OZ is a sister seedling of KATISUE HERRINGTON. Some of the characteristics it shares with its sister are excellent branching, show quality scapes, reblooming many times, pod fertility, vigor, and fast growth. It has its own unique characteristics, however. The petals and sepals are more narrow and more flat that its sister and the scapes are taller. The fans are also a bit thicker. 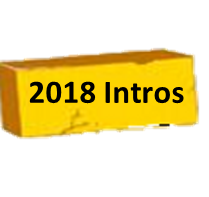 Its pollen is very fertile. When you look at the mass of blooms on the plant, they look like they are dancing. 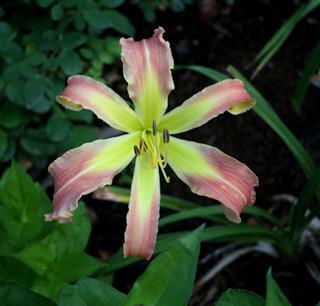 It went on in 2014 to win an Achievement Medal in the Ogeechee Daylily show. (Herrington-K., 2008) 33 x 7 M Re D UNUSUAL FORM cascade burgundy red above a huge green throat. 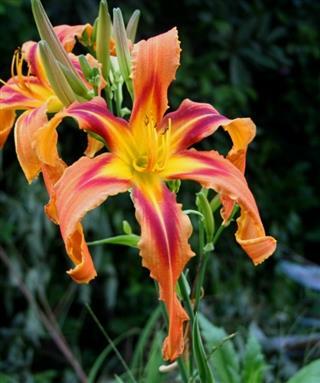 This is a very special, beautiful, and distinctive daylily. As a seedling this flower won the coveted Best-in-Show Award at the Middle Georgia Show. Katisue was swollen with pride to have a seedling win Best-In-Show which indeed is an accomplishment in itself. Awesome is the one word that best describes this flower. Won Best UFO-Dublin Show 2009. (Herrington-K., 2008) 26 x 5.5 Em Re Sev 90% DOUBLE Aunt Em (Dorothy's Kansas Aunt) is a glowing rose bloom that has a prevailing gold throat which compliments the rosy glow that emanates from this full form double. 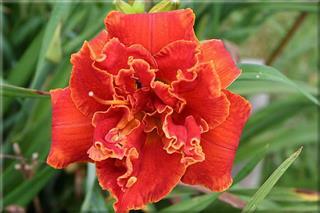 It is lightly ruffled, open and presents itself well on the scape. 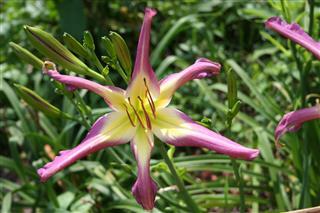 It blooms for a long season and is a bright spot in the garden. (Herrington-T., 2013) 30 x 7.5 Em Sev Re This festive & jovial “OZ” UNUSUAL FORM is carroty orange with a bright red eye that extends into the center of the petals and sepals. It has a yellow throat and midribs that is surrounded by its large red eye. Has above average branching and bud count and is a treasure trove of beauty. 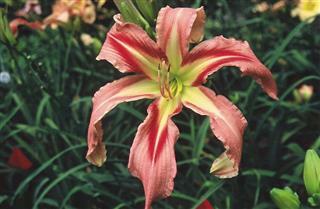 (Herrington-K., 2006) 36 x 9 M Re Sev UNUSUAL FORM Pink with a large bright Christmas red chevron eyezone and vivid grass green throat changing to citron. The white midribs add to the overall bloom effect.Displays 5 way branching and a bud count of around 36. Has won many show awards and was the 2013 Lambert-Webster Winner, 2013 for Best Unusual Form in AHS, H.M. in 2014. (Herrington-K., 2004) 30 x 6 M Re Sev. From the land of OZ you will find Dorothy and Toto in the form of a special tetraploid double with ruffled petaloids. The color combination of this one is quite distinctive with a beautiful rose which radiates outward from the midribs with all edges throughout the blossom becoming a pastel rose. VERY EYE CATCHING!! The 100% double has five way branching & a bud count of 22. Georgia Hybridizers Award 2008,H.M. Award 2009, Ida Munson Award for Best Double 2009, In Region 5 Popularity Poll 2009, 2010, 2011, 2012 & 2013 Won Georgia Doubles Award at AHS National in Columbus, Ohio 2012. Winner of the 2015 Stout Silver Medal. (Herrington-K., 2008) 25 x 4 Em Re D A small UNUSUAL FORM flower that is dark red with a chartreuse green throat that has 6 way branching with 30 buds. 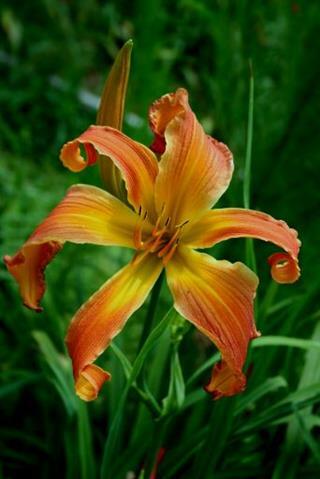 This is a great garden and show flower which is named for the flying monkeys of “OZ” fame; these characters have taken their own place in popular culture just as this uniquely small unusual form daylily will one day Won Best Unusual Form Thomson 2013. (Herrington-K., 2011) SPIDER 26 x 7.5 M D ratio 4.8:1(Petal width 1.25”&length 6”) This beauty reminds you how attractive Glinda was in the Oz movie. This spider is pink with a darker chevron eye above a green throat. 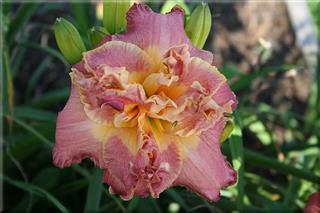 Just as Glinda welcomed Dorothy to Oz, this daylily will welcome you to exquisiteness in your garden. Won Best Spider Atlanta Show in 2014. (Herrington-T, 2012) 31 x6 M D Re DOUBLE Just like the energetic song for Dorothy from the Scarecrow, this energetic “OZ” daylily represents the essence of an unusual form double with its crispate form with quilling. Red with yellow green throat and yellow midribs and distinctive yellow stamens. (Herrington-K., 2003) 41 x 7 EM Re D .SPIDER 4.1 ratio (petal width of 1 5/16, a petal length of 5 ½). Rosy red with a wine red eye & a very green throat. 4 to 5 way branching with 25 buds with ERECT scapes. Pod & pollen fertile. Winner Best Spider 4 times & Best-In-Show 2005-Middle Ga. Club. Displays a multiple bloom scape.H.M. 2004. (Herrington-T., 2010) 2.9 x 24 EmReD Remember in the “OZ” film when the scenery was transformed from black & white to color? Well this little gem is all about color. It has an exciting bud count of 50 plus with the well branched scapes uniformly proportioned over the foliage. Best seedling small flower at the AHS National in Valdosta. 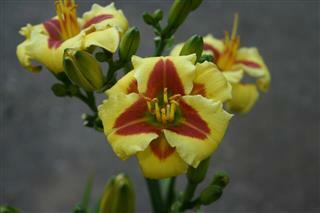 It is canary yellow with a red eye that covers both the sepals and petals. 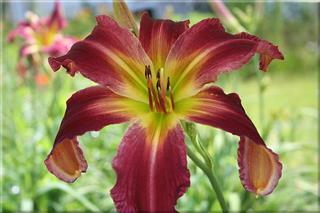 Has won Best Miniature in 3 daylily shows. Winner of the Florida Suunshine Cup at 2015 Atlanta National and Best In Show at the Savannah Show in 2015. (Herrington-K., 2010) 7.5 x 26 M Re D UNUSUAL FORM This purple bloom will display a quilling effect on both the sepals and petals. Has a yellow green throat and exhibits white midribs on the petals. Has 20 buds. It represents a milestone in hybridizing in that it has the quilling effect on both the sepals and petals which is indeed very extraordinary. Winner of the AHS Achievement Medal at the Thomson Show. (Herrington-K., 2002) 40 x 9 M Re D 30 buds,5 way branching. Precious pink color with a darker pink eye above a large green throat. Ratio 4.17.Fertile both ways. H.M. 2005, Harris Olsen Spider Award 2008. 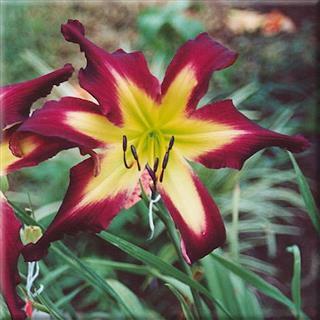 (Herrington-K., 2009) 26 x 6.5 M Re Sev SPIDER Ratio 5:1.125 A dark saturated red-burgundy velvet textured spider of fine clarity, very clear color and carrying power makes this a standout in the garden or daylily show. A vigorous plant with 4-5 way branching, 23 - 27 buds, and destined to become a classic spider. Won Best Spider 1st show entered. Very fertile both ways. 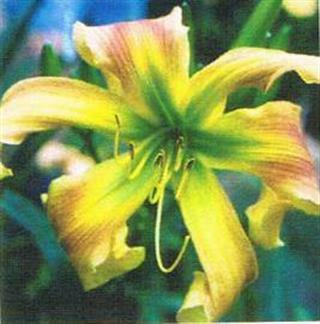 (Herrington-T., 2010) 3.25 x 21 E Re D This small flower is yellow with a huge very intense green throat surrounded by a rose eye that covers over half the bloom. Won Best Small Seedling- Georgia Hybridizers’ Contest 2008, Albany, GA., Makes a dramatic clump in the garden. (Herrington-K., 2008) 30 x 7 M Re Sev UNUSUAL FORM Ext. This magenta purple cascading cultivar with erect scapes has a stunning eye that can spill out as much as 2 “ onto the petals and sepals making it glisten and shine. This is a must parent for streaking and bleeding colors in the throat. 53 way branching with 15-18 buds. Fertile. 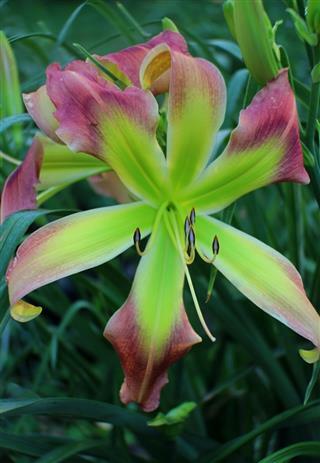 (Herrington-T, 2015) 29 x 4.75 E RE SEV Just like when Dorothy entered OZ and made her famous quote, "We're not in Kansas anymore", this purple with darker eye and huge green throat tells you to wake up and see that it isn't really like your normal daylily bloom especially with very distinctive recessed midribs and rich colors. 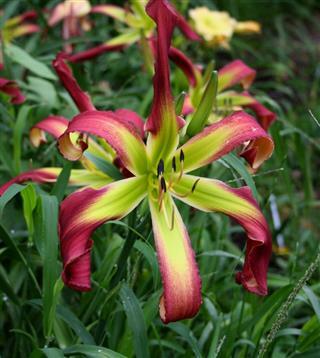 This daylily is very dramatic and possibly the most striking of my green daylilies because it has entered a new arena for single bloom varieties. (Herrington-K., 2000) 48 x 6.75 M Re D UNUSUAL FORM Cascade, 23 buds & well branched. 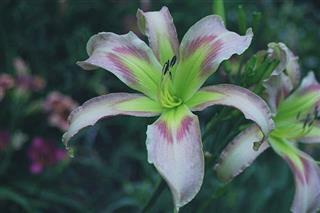 Palest pink cream with light rose chevron above green throat. 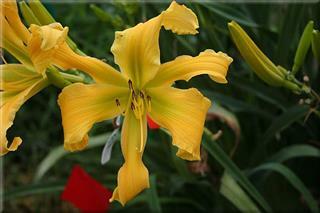 Best UFO in Houston,TX show 2007.A super daylily! (Herrington-K., .2009) 33 x 5.5 M Re Sev UNUSUAL FORM CASCADE. Amethyst purple with a darker eye & white midribs. The wide throat has streaking & bleeding colors. Well-branched scapes. 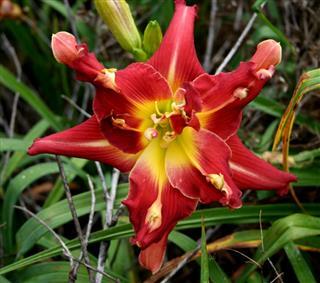 A WOW daylily. (Herrington-K., 2009) 33 x 5.5 M Re D - SPIDER Ratio 4.25:1 The flower deserves the badge of courage just as the cowardly lion did because it is all about having heart. 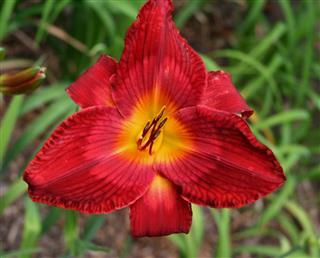 A striking flower of contrasting colors; red with white edging and midribs. (Herrington-K., 2009) 33 x 7 M Re Sev – UNUSUAL FORM. 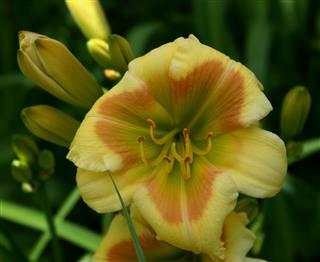 This bronze yellow blend will leap in your daylily bed. 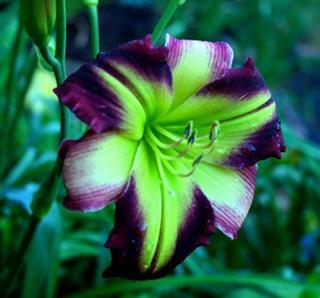 A large striking intense green throat accents this wonderfully, bright, and vibrant flower. The sepals twist & curl like The Scarecrow. 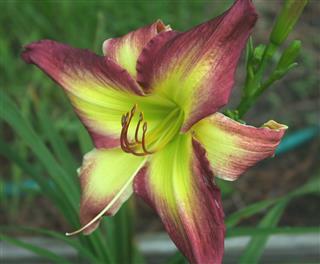 (Herrington-T., 2011) 26 x 6.5 M Re Sev This daylily is purple above an emerald green throat and is all about heart and spirit. The form is widespread and the scapes have six way branching and the bud count is just phenomenal as is theTin Man. (Herrington-K., 2000) 35 x 8 M Re D Unusual form Crispate 25 buds and5 way branching. Rose tangerine blend with rose cinnamon eye above vivid green throat. 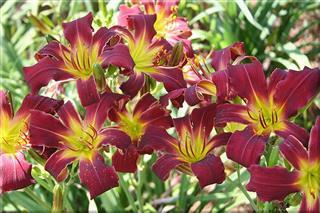 (Herrington-T., 2011) 25 x 5.5 Em Re Sev Start your own OZ theme daylily bed with this beautiful daylily. 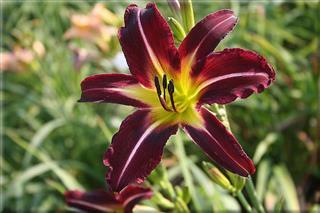 This fabulous, glistening, ruby red tetraploid was named for Dorothy’s famous slippers in Oz. The form is full and widespread making an extremely intense presentation. It is ruby red with a lighter watermark and yellow throat. Great plant habits along with making multiple proliferations on each scape. 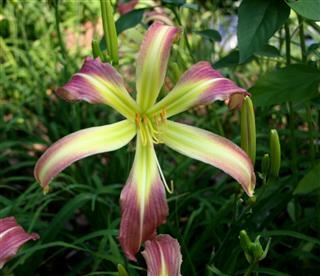 (Herrington-K., 2005) UNUSUAL FORM 28 x 8.5 Em Sev Re Fr Purple with a green throat and a huge distinctive star shaped yellow eye. Its unusual form is crispate and sometimes it cascades also. With 4 way branching, 27 buds, ERECT scapes, and fertile both ways, it definitely will be a star in your garden. 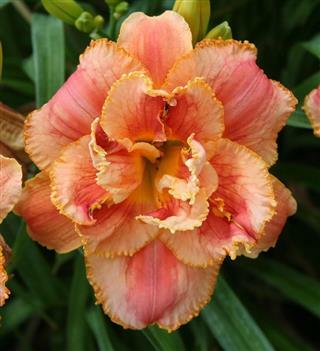 (Herrington-T, 2015) 30 x 7 EM RE EV This Unusual Form Cascade explodes with an intensity or saturation not seldom seen in the average daylily. 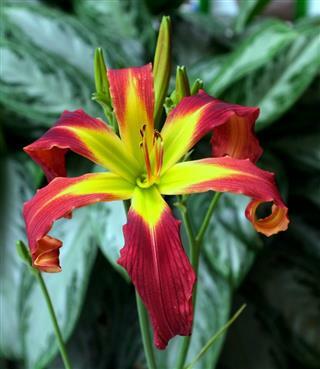 This colorful vibrant red and orange flower has a tiny green throat which makes a riot of color above the foliage. 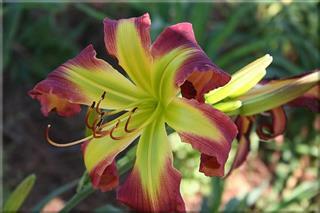 The color and substance are sunfast The strong, and dependable, recurrent scapes have 4 way branching and 19 buds. (Herrington-K., 2007 ) 30 x 5.5 Em Re D 100% DOUBLE A glowing 5.5 bloom showing many shades of red/orange blended together. The petaloids tend to be darker with light edging on them as well as the petals & lighter sepals. 4-5 way branching and up to 35 buds. (Herrington-K., 2011) SPIDER 30 x 8.75 M D ratio 4.8:1(Petal width 1.25”&length 6”) This big spider is lavender rose with a green throat and is enhanced by a white stripe down the center of the petals. 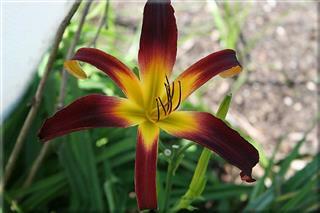 This daylily gives visitors a warm hello and welcome to my garden. 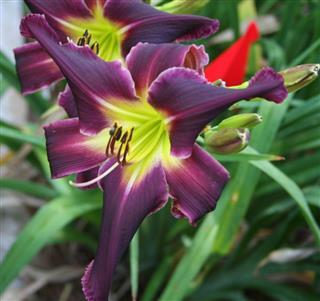 (Herrington-K., 2012) 22 x 5.5 M D Re Even though its named for the most significant antagonist in the Wonderful Wizard of Oz story, as a daylily this unusual form is an astonishing dark purple with pencil thin white edging. 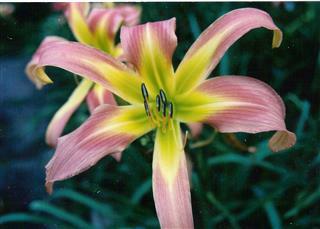 The form is open and narrow with raised midribs on the petal. (Herrington-H., 2012) 29 x 10 M Sev Re SPIDER 1.25 x 6 ratio. 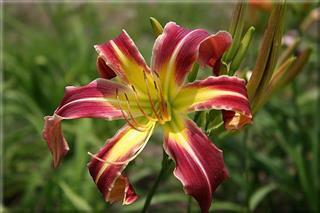 This very large cardinal red spider with huge green throat is a daylily that is greater than the sum of its parts. Magnificent in a clump, the well-branched, recurrent scapes hold the giant blooms well above the foliage.